Rodents, termites, and bees…oh, my! These animals are called pests for a reason. Not only are they not paying rent, but even worse, they can cause significant damage to homes, costing homeowners thousands in repairs. In a recent survey, 84 percent of American homeowners reported having issues with pests within the last year. If you think you needn’t worry because you have homeowner’s insurance, think again. Most insurance policies do not cover damages from pests. However, there are ways that you can protect your home (and your wallet) from pesky critters and the damage they cause. Rats, mice, and squirrels wreak havoc on homes and their inhabitants by chewing on insulation, siding, and soffit. Rodents also damage wiring, which is not only a nuisance but also a fire hazard. In addition to hurting your home’s structure, these rodents easily spread bacteria and viruses in their feces and urine, which is just not healthy for you, your family, and other invited guests or roommates. The National Pest Management Association reports that termites are responsible for over $5 billion of property damage every year in the U.S. Getting rid of termites isn’t a do-it-yourself task if you want the job done right. Since there are several different types of termites, it is best to call a professional for help. Termites aren’t the only insect that can infest wood, though. Lyctid beetles can infest cabinets, doors, flooring, and other hardwood in your home. To solve the beetle problem, it’s usually best to dispose of the infested wood completely – making prevention an even more important step. Your skin isn’t the only thing that honey bees can sting. 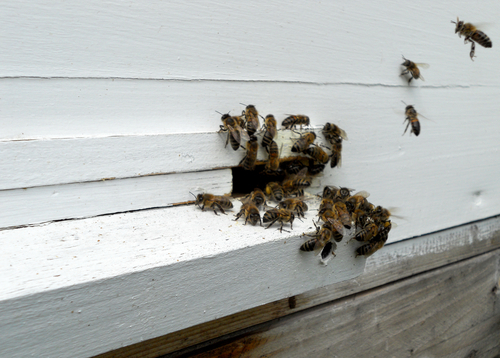 If they create a hive inside your home, they can sting your bank account, too. While honey bees don’t cause damage to your home directly, if you spray them with insecticide, the dead hive will attract other unwelcome critters. Your best solution is to hire a pest control company that specializes in bee removal. There are many types of ants, and they all present problems with varying intensity. Carpenter ants that hollow out wood and fire ants that destroy electrical wiring are two of the most destructive ant species. Other types of ants are often just a nuisance to have around your house, munching on your food. It may come as a surprise that insurance companies usually do not cover damages caused by these common pests. The argument is that most pest damage is avoidable through proper home maintenance and pest prevention. Therefore, the homeowner must pay out of pocket for the needed repairs. In some cases, insurance may pay for part of the damage if it is considered sudden and accidental. For example, if termites destroy a structural beam that causes the roof to fall, the insurance may cover the roof repair, but would not cover the cost of repairing the beam. Normally, large bills caused by pest damage aren’t from an infestation that appeared overnight. That’s why it’s important to always be on the lookout. Even though homeowners’ insurance doesn’t help much with pests, there are ways to keep critters and their potential costs at bay. Some basic things to do around your home to keep out pests: store food in sealed containers, place screens on windows and doors and seal cracks around them, and keep foliage in your yard trimmed so that it doesn’t touch your home. Pests may cause damage over time in hidden areas of homes. Scheduling an annual or biannual pest inspection is your best insurance against costly home repairs caused by secret pests. If pests are found during these inspections, your best bet is to hire a professional pest control company to help you exterminate all creatures that could prove costly to your home and health.